Jim DeVincentis has been my business partner and Executive Producer at Przyborski Productions for the past 28 years. We started the company together in 1988. Every agency person and client we’ve worked with calls him “Jimmy D” or just “D”. 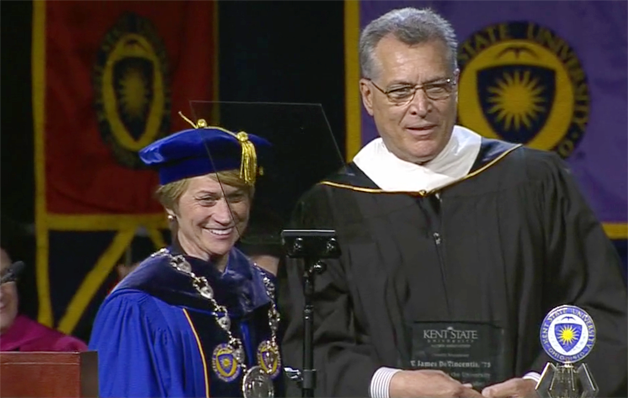 This past weekend, Kent State University asked D to give the commencement address for graduates of the College of Mass Communications and Information, College of Business Administration and College of Applied Engineering, Sustainability and Technology. D also serves on the National Athletic Development Council for Kent State and is featured in their Athletic Hall of Fame. Jimmy’s daughters, Dina DeVincentis and Maria DeVincentis were part of the 7,000+ Convocation Center crowd. Dina graduated in 2011 and Maria graduated that same day. We’re now calling “D” the honorary “Doctor D”. Kent State’s football “team room” was recently named in honor of Jim DeVincentis, a 1984 inductee into the Varsity “K” Hall of Fame. The newly-renovated space includes extensive wall graphics, an enhanced video system and ample seating for the entire team. 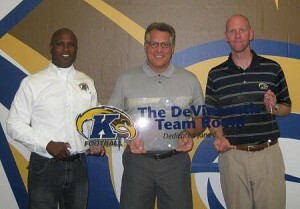 DeVincentis was a four-time NCAA qualifier and was twice voted captain of Kent State’s swimming team. Named the Mid-American Conference’s Most Outstanding Swimmer in 1975, the McKeesport, Pa., native won 13 MAC Championships (6 individual, 7 relay) and set three school and seven conference records. DeVincentis graduated from Kent State in 1975 with a bachelor’s degree in telecommunications & business and currently serves as member of the National Athletic Development Council.